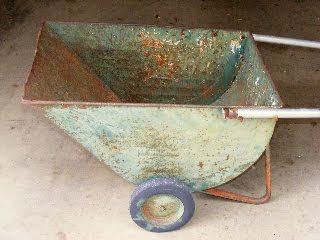 I know...it's a wheelbarrow. 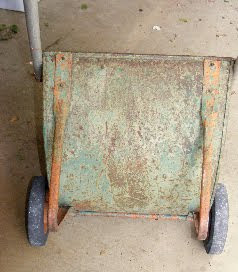 It's a rusty old perfect shade of green with bluish undertones wheelbarrow. We know we could put it in the garden and put pots of flowers in it. The puzzler is that Jennie wants to use it in her house in some creative way. What do you think? Could it be some sort of table? Do we take parts off of it? Add to it? Turn it upside down? Hang it somehow? Could it be some sort of storage? Jennie likes the industrial look of it, the color of it, the vintage feel of it and wants to use it in an unexpected, creative way. Problem is, we aren't quite this creative and can't figure out what to do. We're counting on all you bloggers to help out. If you know other creative bloggers that might be able to help, tell them to stop and visit and give us a clue! Really I'm not that creative either but...laundry basket, toy holder or sitting in the corner with plants,large candle holders and baskets of flowers? I could see it as a table if you could remove the handle and put a top on it. 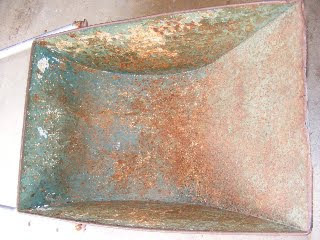 If you could seal the rust then I could see it as a great magazine rack. Have fun with it. Wow, I'm honoured you'd ask me! When I create, I first think of what I NEED. From there, anything's game if it's the right dimension. Do you need an awesome planter out in the yard? Firewood storage? Side table? 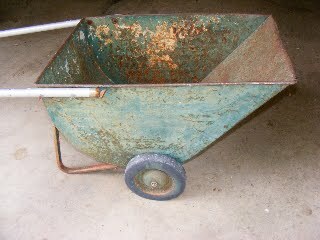 One year my neighbour had this wonderful old rusty wheelbarrow. She turned it on it's side and it had the illusion of growing flowers spilling out of it. It was wonderful and different! I'd love to get my hands on that old relic of yours. :) I'd use it for any of those things I listed myself. Have fun!! How about to hold a pile of beautiful old quilts or afghans? I would put a glass top on it for a great side table or possible coffee table depending on the height of it. You may need to remove the handle due to the balance point. The glass top allows you to still see the beautiful color inside and out. 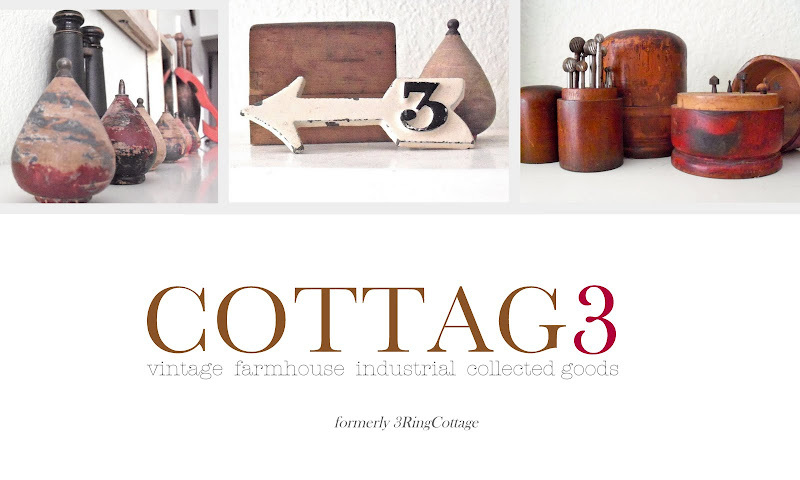 You could use it to store collectibles such as croquet balls, string/fabric balls or some other favorite item. Girl I am rackin' my brain. . . I'll get back to you .. . Thanks for the vote of confidence, I was certainly surprised to be mentioned in the same sentence as Donna! I'll bet she has the best idea, this is right up her alley. As for me, first of all I can't quite tell how large this is as there is nothing in the pic to give me an idea of the scale. If not too big, it would make a great piece in the bathroom for holding rolled up towels and extra tp rolls. I would just brush off any crumbling rust pieces and seal it really well. I would probably remove the handles, as they look rather insignificant with the piece (at least from what I can see of them. A bin for firewood would be another great use. If you could stabilize it, (turn those handles down to create legs that hold the 'barrow upright) I can see it as a side table with a glass top showing off some cool stuff stored inside it. There are so many endless possibilities with this. Love the laundry basket idea too! I'm sure whatever you come up with for it will be brilliant. Awesome piece! I would use it as a shoe bin. I don't know about you but I always have TONS of flip flops and dirty shoes at my front door and I would love to stick them in a cute bin like that if I had the room. A boys toy box would be cute too. I don't know how big it is, but you could probably fit a bunch of soccer balls and footballs and the like in it. Hmmm...I might be going out on a limb with these suggestions - but three ideas came to mind. My second idea was that if you have animals (a dog, for instance) it could make an interesting lounging area/bed for them! You would have to figure out which side to lean it on or possibly build a couple of steps to make it more accessible. My last idea, is something I have seen done before - but it's not really an indoor use. I have seen old wheelbarrows used as portable fire pits/grills. It works great and is a great idea - but if you want it used inside, I suppose it's not appropriate. I also have tried to find a way to turn it into shelving, or a cabinet...maybe even suspend it from a ceiling somehow? I am not sure how to make this worth the effort though...or where it would fit in your home. okay, may be somebody said this already...I would fill it with ice and drinks for summer outdoor parties. other than that , if she has a large bathroom, she can roll up towels in it, or a massive amount of toilet paper storage! I know, I look like a poser with the susie harris sign! I did email her and tell her I was a copy cat. I think we should start a new linky category..."susie harris knock offs"
i feel so totally outclassed. All I could think of was "a planter?" And couldn't come with any ideas for how to use it inside. you probably already used it...since this post is old, but i just found you and am looking at your back posts......i would use it in my office to store files in....or...use it by my door to toss read newspapers in for recycle....or put something is as a filler and just make it a plant stand....i have to say, i also see what i 'need' and then look for the right dimensions.....try a bunch of different things for a week and see which you like ! i can also just see it as a decoration...like on top of a cupboard or something...just enjoying the patina !